I have got a very sensitive skin and so there are only so many products that I can try! I am very particular about my skin. I only try something that I feel would work really well for me. I used to try products after reading about a dozen reviews but to be honest most of those times the products didn't work for me at all. So now all I stick to is the products that I know are a 100% going to work for my skin. Yes To is a brand that I wanted to try for a really long time now. But I thought it was a really over priced brand. It claims to have 99% Natural ingredients in it's products which impresses me the most. Again, not all natural or organic products really work for my skin. So I am really happy that I have found a brand that serves me with the perfect blend of ingredients. 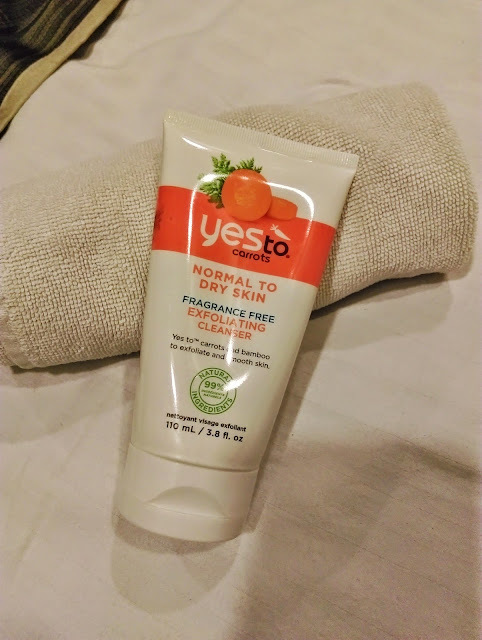 Whenever I am trying a skincare brand, I try to go with their face wash first because I feel like it gives me a pretty good idea about the whole range. So naturally when I was finally done with my Dove Face Wash I decided to give the face wash from their Carrots range a try as it is meant for normal to dry skin. BOY! I am so pleased with the results. It is a really mild exfoliating face wash and the bonus part is that it is fragrance free! It comes in a 110 ml tube (another check in the 'perfect face wash list') and it really cleanses my skin at the end of the day. It's most probably psychological but I feel like it makes my skin feel so fresh (a must in this INDIAN SUMMER). So overall it really works for me and I have already ordered another one! *GUILTY* I also can't wait to try other products from this range. Have you tried any of the products from Yes To? Leave a comment below if you have tried any of the products or even if you have any products in your wishlist from this brand. © The March Diaries | All rights reserved.